Aiseesoft Mac FoneTrans is a professional iPhone, iPad and iPod manager for Mac. It can easily transfer photos, music, contacts and more other files between any two iOS devices. Transferring files between Mac and iDevice is also available for you. Besides, it fully manages the files on your device such as editing and merging contacts, saving messages in excel, text or html format and so on. You can also transfer files to iTunes for backup. Aiseesoft Mac FoneTrans is better than iTunes which can easily help you transfer files such as music, photos, contacts and so on between Mac and iOS devices. It can also help you transfer files such as photos, playlists and contacts, etc. between any two iOS devices. With it, you can also backup movies, music and playlist, etc. to iTunes without any loss. Mac FoneTrans is perfect software to manage your iPod, iPhone and iPad. Moreover, it is highly compatible with the new iOS 12 and iTunes 12.8. Want to transfer your favourite music, pictures or videos to your iPhone? That shouldn't be a problem any longer. With this software, you can export videos, music, contacts and more from Mac to your iPhone, iPod or iPad as easy as pie. 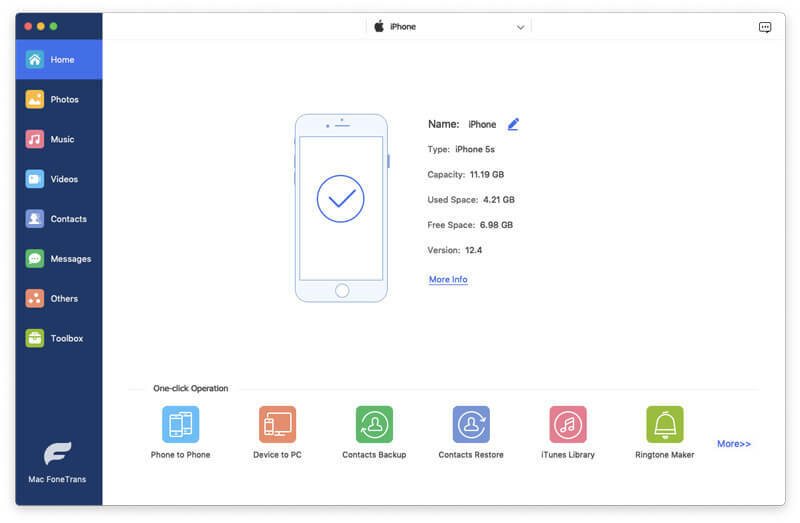 Whenever you transfer incompatible files to your device, this iOS transfer tool will convert the file properly for you.